Give me a chance to add additional meaning with beads, crystals or stones and I’m all about it. It happened with Unchained, a necklace that represents freedom from day-to-day, 9 to 5 drudgery. The lure of copper and brass attracted me to the unusual strip of metal in the first place. At an open studio swap meet I could hardly tear my eyes away from the rustic copper plate with its simple cutouts. Before the seller could change her mind, I grabbed the piece and said “It’s mine.” At the time, I didn’t know how the piece would shape, but I knew it was fab. Although I looked at other tables and different presentations, the evening was over for me. I wanted to begin this new project. There’s sometimes more attraction in the re-making than in the new. This was one of those times. As I started to assimilate the up-cycled metal, I discovered challenges, such as the re-shaping of jump rings (every one of them was squished instead of round) and the re-weaving of wires to hold the chains in place through the open plate. Readers of this blog know that my forte is beads, not metal. “How different could it be to weave with wire?” I wondered. Quite different. For a few days, I set the project aside. There it lay, calling for brass and copper charms for the chains. I made a few charms to satisfy the urge to create . Because I couldn’t match the missing chain in the strip, I added a third metal – brass – to the piece. The links mirrored those of the initial piece. Turns out it was a brilliant substitution. 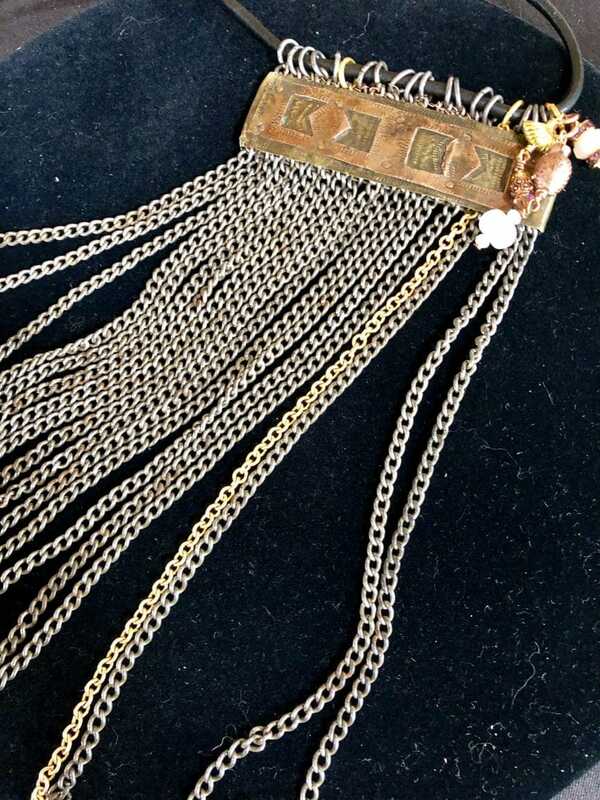 The brass chain is an attention-getter representing one big chain. Read on to learn more. I called my customer for clarification and further inspiration. She told me she was planning to sell her business and travel full-time within a few months. Suddenly, I saw the brass chain as prophetic – the one chain that tied her to a different reality. The charms came together with additions of rose quartz, the crystal of love. Not only would she travel, but she’d find and reflect love in the process. I had envisioned a necklace that literally danced. Now I could see how the movement of my chain completed that picture. I threaded supple, round Greek leather through the jump rings and tied it in the back. It couldn’t be more suitable. Then, I picked a specific piece of rose quartz that she could drop in her purse. When I know the circumstances of a particular customer, I’m all about collaborating on a design to manifest a specific intention. Unchained does that. I can’t wait to hear the tales it will tell.